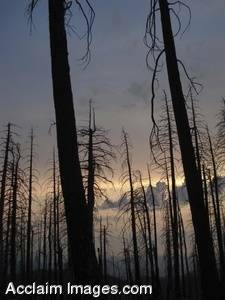 Description: Stock Photo of Burned Forestry in Oregon. This photograph shows bare trees that had been burned a few years earlier in a bad forest fire. The photo was taken on Grizzly Peak near Ashland, Oregon the summer of 2006. This photo is available as an art print or poster and may be licensed as stock photography as well.